Missaukee County outdoor recreation ranges from exploring the Pere Marquette State Forest to kayaking down the Muskegon River. 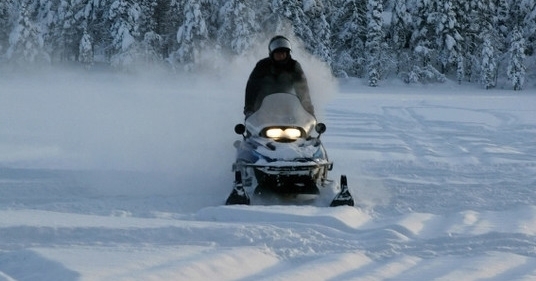 With plentiful snow and vast stretches of state land, Missaukee is a destination for snowmobilers throughout the Midwest. The primary trail is named simply “6” and traces state land that runs along the northern boundary of the county. The 651 trail, also running predominantly through state land, drops south into Lake City, on the shore of Lake Missaukee. From Missaukee, riders can go for hundreds of miles because the trails continue on into neighboring counties and connect to other trail networks. The Pere Marquette State Forest runs nearly continuously in a wide strip across the northern boundary of Missaukee County, and more state land embraces the upper reaches of the Muskegon River, running along the eastern edge of the county. This rich resource of more than 100,000 acres of public lands is readily available to residents of Missaukee, who can make the outdoors an easy and regular part of their day to day. With nature so accessible, it’s easy to head out for hikes or to go hunting for whitetail deer and small game after work or on weekends. Many families scour the May forest for morels, a delicacy known the world over. One of Michigan’s most renowned rivers, the Muskegon, begins its run among small creeks and rivers of Missaukee County and then traces several miles along the county’s eastern border. Here in the upper reaches, the Muskegon is smaller, twistier and more intimate than the broad river that the Muskegon becomes in southern Michigan. For residents of Missaukee who canoe and kayak and fish, the river in these upper reaches is a quiet and secluded stretch of water that makes a rich addition to life here—readily accessible for after weekend and evening escapes to rejuvenate in nature. The most renowned lake in Missaukee County is Lake Missaukee, and for good reason. The lake serves up approximately 1,900 acres of shimmering H2O, has a bustling resort scene and is known as one of the state’s premier warm-water fishing lakes. Missaukee County also offers about 20 more lakes, more in the 20-acre to 300-acre size, which appeal to people looking for quieter waters for their homes and cottages. Of course, for people who live here, the many lakes of Missaukee County offer plenty of year-round opportunity for outdoor recreation. Fishing, swimming, boating in the warm months and ice fishing, skating, skiing and snowshoeing in the winter can be regular parts of life, not reserved for precious and limited vacation time.